As we continue to grow the Crimson Kings, we are seeking a guard instructor to teach and build a guard line in the heart of New York City's Chinatown. You must have a clean record and experience teaching youth groups ages 7 to 22. You should be a patient team player with initiative interested in assisting further development of national and color guard programs. You are enthusiastic, works well with youths, and loves everything there is to love about color guard and drum corps activities. 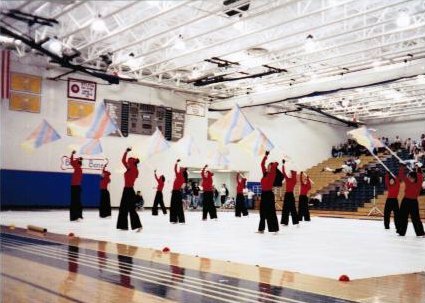 You will be responsible for teaching a range of experience levels but mostly beginners, creating routines, and working towards developing a winter guard program. Experience with drum corps, winter guard and/or marching band is ideal though we are open to similar type experiences. Please list any experience in the following areas: rifle, saber, flag, choreography, dance/movement, gymnastics, martial arts, makeup and hair, special effects, drama/theater, and costume design. Being multilingual is a plus in either Chinese and/or Spanish but not a requirement. This is a part-time year-round position. Times, requirements and compensation to be discussed upon contact. Please send resume and contact information to info@crimsonkings.com. Q&A with Johnny Molina, Jr.